I made this card using Papertrey Chocolate Remix patterned paper and Sweet Blush cardstock and vellum. I colored the chocolate text boxed paper with copic markers. The sentiment is from Everyday Blessings. 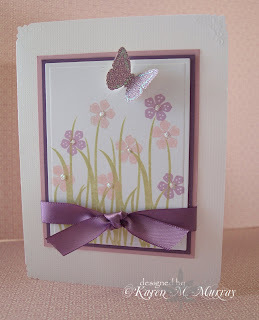 I stamped the butterfly from Purple Daisy Designs in Versamark on the vellum and embossed with Pink Embossing Glitter from Ranger. I used the coordinating punch from EK Success to punch the butterfly. Gotta love a coordinating punch, uh? The ribbon is satin Papertrey Chocolate . 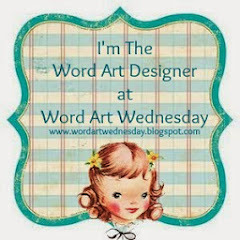 This card was made using this sketch from Papertake Weekly Challenge. I wanted to use the vellum as my card base, so I made another card using Honey Bees and the Linen Vellum, Lavender Moon and Plum Pudding. 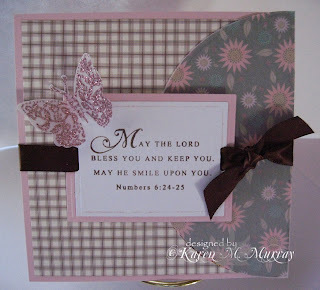 The butterfly is Guide Lines patterned paper punched with a Martha Stewart punch. I added diamond stickles to the flower centers and the edges of the butterfly. The corners are punched with a Fiskars corner embossing punch, although you can't really see the embossing very well in this picture. The ribbon is satin Papertrey Plum Pudding . I had the hardest time getting a picture of this card. I think I spent an hour or more just trying to get a good picture. This was the best of the bunch, but I am still not all that excited about it. I came to the conclusion that vellum is not very photogenic. OOOOOhhhh!! These are gorgeous - well done that woman. They are both wonderful cards. those are lovely. i enjoyed looking at them. Wonderful cards! I love how the vellum softens the look. Its just beautiful. These are so beautiful!!! I really love the honey bee one. 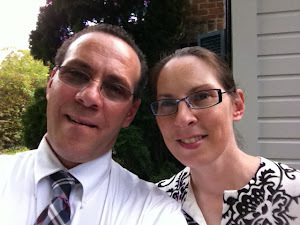 Welcome to the blogging world! So glad you joined cause I love your projects. The vellum overlay softens the card so well. It makes me really really want that chocolate remix patterened paper!! You are right, it is hard to photo vellem but your photos look great!! Thanks for the inspiration! these are both beautiful- wonderful job! Very nice! 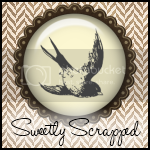 I love the colors you chose on the honey bees card, very pretty and with just a little touch of sparkle :-) How does a mother of 6 find time for herself - you go girl! Beautiful! Both cards are lovely. Fantastic job. They are both gorgeous, Karen, but I love that top one! I love that pattern paper underneath and the great colors! Both are gorgeous! I especially love the layout on the top one--great job! these are so pretty! I especially love how the vellum softens the patterned paper. These are beautiful! I especially love the second one- it's so elegant and serene! So very pretty! Both of them although I am leaning towards the second one, I think !! I just love flowers! I do like that lilac card w/the butterfly. oh wow, i like this card., so elegant. Your cards are SO SO beautiful. I love the butterflies....so pretty. Great color combinations.